This recipe was in the Jan/Feb 2012 issue of Clean Eating magazine. This was originally a crock pot recipe, but since I am not very good at preplanning, I ended up baking it in the oven. It turned out so very good. Please note that I did make a few modifications (I omitted the mushrooms - don't like, and chopped tomatoes, didn't have any), so please note that my version below is slightly different than what's in the magazine. Please note that I could not find this recipe online, so I have just included what I did below. If you want to make in the crock pot, just mix everything into the crock pot instead of the baking dish and cook on low for 6-8 hours. Sprinkle salt and black pepper on all sides of the chicken and then cut into bite-sized cubes (about 1 inch). To a greased baking dish mix all ingredients except the spaghetti squash and the cheese. Bake at 375 for about 25 mins or until the chicken is cooked. While this is baking, pierce your spaghetti squash a couple of time with a fork and cook (1 at a time) in the microwave for about 8 mins. Then cut the squash in two and scrape with a fork to remove in strands and be sure to remove the seeds. 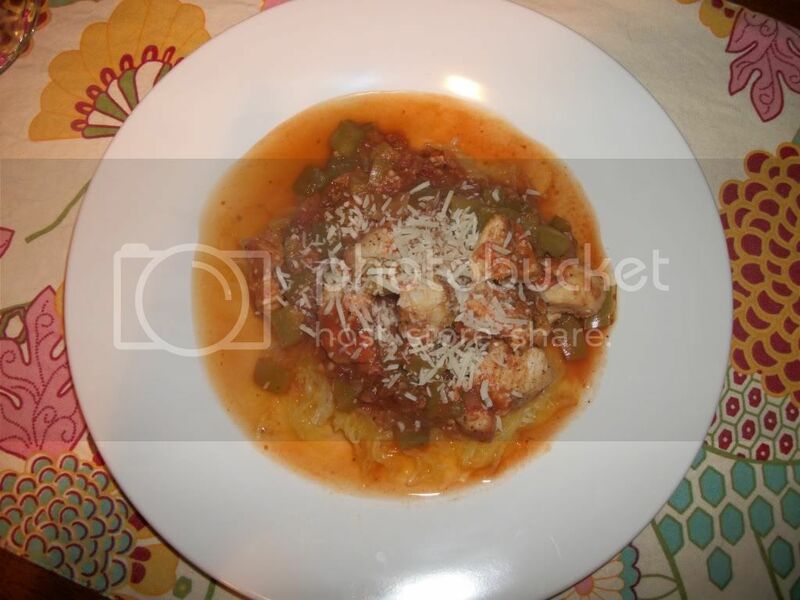 To serve, put some spaghetti squash on a plate and top with the chicken mixture and a little cheese. Enjoy!